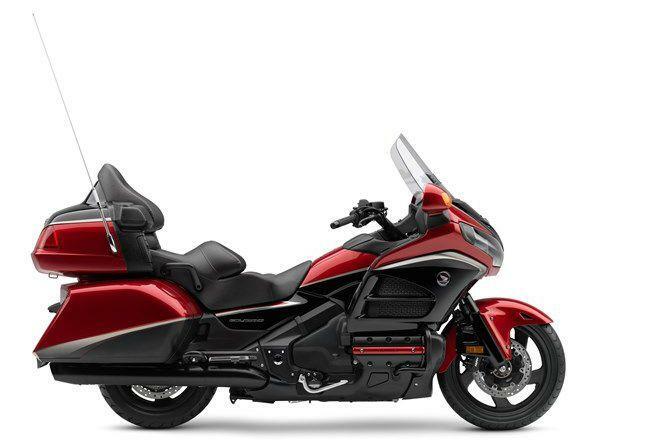 THE Honda Goldwing has been with us for 42 years since its 1974 launch and the fifth-generation version’s 15-year life makes up a disproportionately large portion of that time. Now it finally might be up for replacement. While rumours of new Goldwings come about with monotonous regularity, the latest information is that Honda’s flagship machine will be replaced in 2017 with a completely new model that finally repositions the bike as a technological standard-bearer. Back when the current bike was launched in 2001, the sort of high-tech gizmos that now appear on even fairly mundane machines were barely imaginable, so there’s plenty of catching up to do. The next Wing will have all Honda’s latest tech and more. So what can we expect? Well, a DCT semi-auto transmission is a certainty – Honda long ago filed patents for the Goldwing’s version of its twin-clutch gearbox. There will also be electronically adjustable, semi-active suspension and several patents point at an unusual front suspension system for the next-gen bike. At least two different versions have been designed, both based around a completely new type of leading-link front suspension with a mind-boggling linkage and a single shock. It could be that Honda has decided that traditional forks are just not man enough to cope with the Wing’s enormous mass, and that a more complex, multi-link arrangement will give them the opportunity to add advanced anti-dive geometry to allow a luxurious ride without wallowing handling. The airbag system pioneered by the current Wing looks set to continue to the next bike, but several of the firm’s latest patents have related to the instruments and controls – in particular trying to work out the best way to add even more buttons to each bar. That suggests some complex infotainment system is going to be included. Big TFT screens are certainly part of the dash design. Ride-by-wire and all the traction control and multiple riding modes that entails will, of course, be standard. One final element that's also under development, but may yet be too much of a leap for the next-gen Wing, is a hybrid drive system. The idea is to incorporate an electric motor into the engine/transmission unit, allowing a less powerful, smaller-capacity petrol engine to be used. The firm’s Neo Wing three-wheeled concept bike last year showed off just such technology, adding electric motors to a foreshortened, flat-four version of the existing Goldwing six-cylinder engine. Some of Honda’s recent Goldwing patents do incorporate just such a flat four and hybrid technology, while others show the bike with a six-cylinder engine fitted, suggesting that both ideas are under parallel development. Finally, there will be a new chassis and bodywork wrapped around all this technology. The new frame is believed to be a two-piece cast-aluminium affair, with separate front and rear sections using the engine as a load-bearing centre part. The Neo Wing concept probably gives the best hint yet at the next-gen Wing’s styling.